No matter where you are in the world, it has become common to encounter locked iPhones. This usually happens when iPhone users get their devices from carriers like AT&T. What makes locked iPhones the way they are? Locked iPhones have a software code that stops you from using the phone on another network or wireless service, which may result in your staying with the same carrier. According to some carriers, one of the biggest reasons why they sell locked phones is to limit phone theft. It is the experience of some iPhone users that their stolen iPhones are offered in the black market for trading. The lock status, however, is especially frustrating to iPhone users. You will not be able to switch your wireless operators easily. Locked iPhone limits the freedom to choose one’s carrier or service provider. This means that you could get stuck with a particular carrier the moment you buy the iPhone. To use another carrier, you may have to purchase another phone. If you are planning to purchase a pre-owned iPhone, you need to check first if it is carrier-locked to skip the bad consequence coming later. 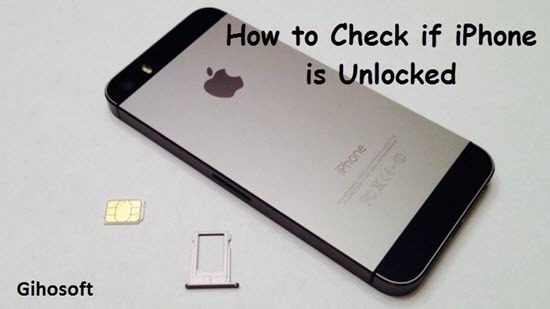 Here are 4 effective and easy ways to check if your iPhone is unlocked or not. Tips: If your iPhone is disabled due to wrong passcode entering, you can check this Tips to Unlock a Disabled iPhone without iTunes. The oldest and easiest way of checking the status of your iPhone is by looking in the Settings. The steps to do this are outlined below. 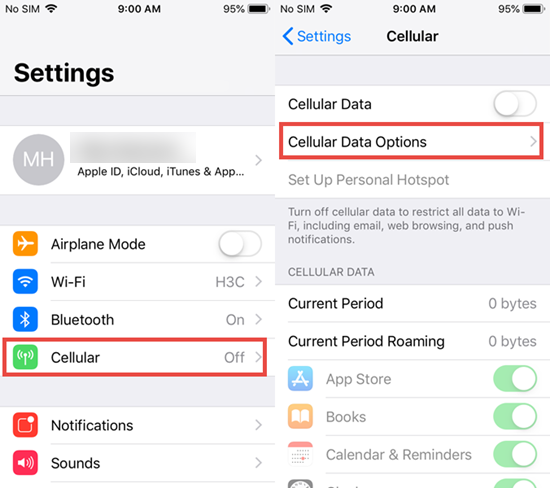 Once you are there, try to find an option named Cellular Data Network/Option (some may called ‘Mobile Data’). If it is there, then the iPhone is not locked. Locked iPhone won’t have this option. For iPhone, the SIM card enables the device to get mobile and data service. It is also actually a good way to check whether the iPhone you have is locked. To do this, first turn off the iPhone. Then follow the steps outlined below. Note that these steps only apply to iPhone models that have SIM card slots. Find your iPhone’s SIM card slot. Once you locate it, open it with the eject tool. If you are having trouble doing it, use a small paper clip. Usually the SIM card slot can be found along the phone’s side casing. Take out the SIM card of the iPhone. Put in the SIM card from a different carrier. Insert the SIM card slot tray back into the iPhone. Then turn the iPhone on. Enter the passcode of iPhone if needed. You will be able to know whether the iPhone is carrier-locked or not by clicking the iPhone settings. If a display says “SIM Not Supported/Valid” or ask for “Activation Code” or “SIM Unlock Code’, that means the phone is locked. Otherwise, you are free to use any other mobile service provider. You may not know this but doing a factory reset actually also helps in knowing whether your iPhone is locked or unlocked. How exactly can this be done? Read the steps underneath. Reset the iPhone to its factory settings. Go to Settings. Find General > Reset and then click Erase All Content and Settings. You can also reset it by using iTunes. Make sure you have made backups for your files before doing this to avoid data loss. If you see that the screen displays “Congratulations, the iPhone is unlocked,” then it is not locked. 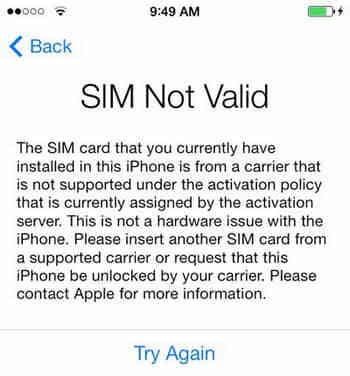 But if you get this message in iTunes or on your device: “The SIM card inserted in this iPhone does not appear to be supported,” you may have to re-insert the SIM card from your original carrier. You have the option of visiting the carrier’s store to see if there are other options to unlock the iPhone. Of all the methods here, this takes the longest time and is best to do only when you have no other choice. It involves signing your iPhone up to the IMEI Info website, which is an online checker to tell the lock state of your iPhone. The International Mobile Equipment Identity (IMEI) acts as a unique identifier for smart phone. Each phone can only have one. Think of it as an identification number that only your iPhone has. Follow the steps below to see how to use the online service to know the carrier status of your iPhone. Just serach “IMEI Info” on the Internet and find the registration page of the website. Find your IMEI. You can find this number by going to iPhone Settings > General > About. You will see the IMEI section there. You can also find the IMEI on the SIM tray in some iPhone models. For some old iPhone models, you can just find it on the back side. 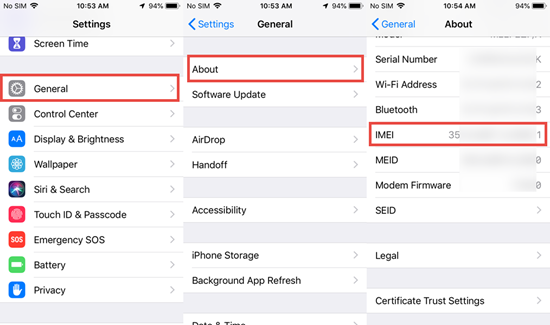 Once you are on the main page of IMEI Info, enter the IMEI number. Accomplish the short “I’m Not a Robot” test. Proceed to Check > SIMLOCCK & WARRANTY > Check Apple Phone. If the result is “Unlocked: false” then the phone is carrier-locked; while “Unlocked: true” means it is unlocked. If you want to make sure that you are getting your money’s worth, do not forget to check whether a pre-owned iPhone is locked or unlocked. A locked iPhone will limit your freedom to choose the carrier that you want, which is why you should inform yourself of the phone’s lock status. Otherwise, you may hope that your seller has a decent return policy if you really do not like the current carrier. If you have any question or suggestion, welcome to contact with us by commenting down.